Ok, who doesn’t love getting packages in the mail? I am pretty sure I did one of those really girly squeals when I saw the package sitting on my front steps yesterday. I knew what it was before I opened it. I set it on the counter unopened and grabbed my new favorite tea mug my sister gave me this Christmas and began making some tea. Then I rushed to the table, tore it open and proceeded to do a happy dance that almost spilled the tea! Next, I took a picture to share my excitement on my Instagram and of course to use to share with my blogging friends. 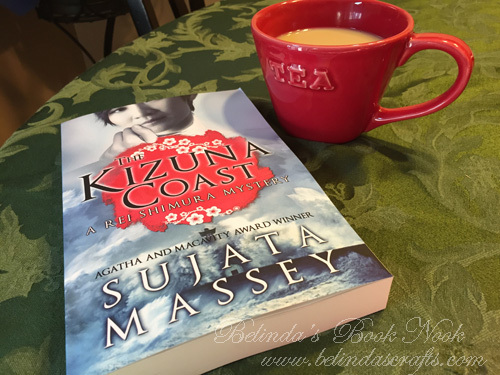 The book is called The Kizuna Coast: A Rei Shimura Mystery by the amazing Sujata Massey. Oh I am pretty sure I have told you on a past post how much I love this author’s works. I read her first book in this series while working at a news paper back in 1997. I loved the cover and my strong interest in Japanese culture since I was a child, compelled me to pick up the book. I went home and couldn’t stop reading. I remember reading into the night. I loved that Rei, was a strong character that allowed me to peek into the Japanese culture and learn while going on her mysterious adventure. I was hooked. I bought every book in this series since then. Each one providing me with not only a great story with strong characters (many who continue on in the series) but with new aspects of the Japanese culture. So when found out a new book in the series, Kizuna Coast was coming out soon. I pre-ordered the e-book online since it was going to arrive earlier and then pre-ordered the book to keep with the rest of the books in the series. Anyway, when I finally sat down to look at the book, I acted like such a book nerd. I held it in my hand and marveled at the feel of it in my hands. The cover is so gorgeous in person and the pages feel so good when you turn them. Now only a true book lover will appreciate these last comments so what I am trying to say is that I am so happy and look forward to reading the book. When an earthquake triggers a tsunami that floods Japan’s northeast coast, amateur sleuth Rei Shimura is pushed into her most rugged adventure yet. It starts with an SOS from Rei’s beloved elderly friend, the antiques dealer Mr. Ishida, who’s trapped among thousands on the ravaged Tohoku coast. 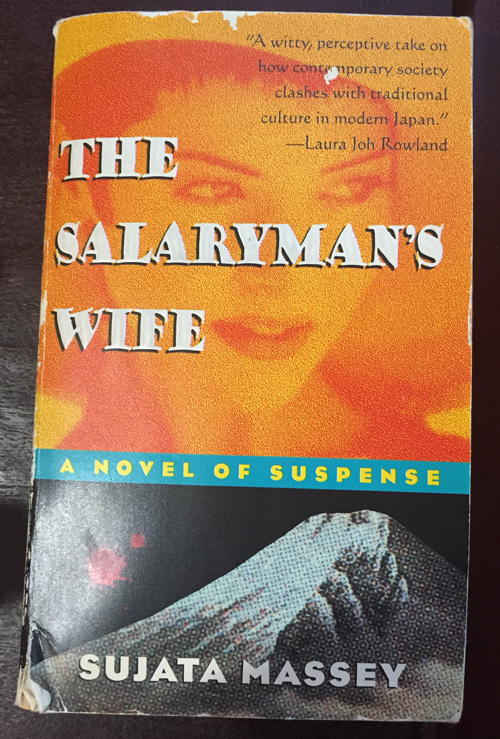 Rei rushes from Hawaii to blacked-out Tokyo, where she discovers Ishida Antiques may have been burglarized and its cuddly watchdog, Hachiko, needs a caregiver. Rei and Hachiko board a bus full of disaster volunteers headed to the damaged town of Sugihama. Once there, they learn about the disappearance during the tsunami of Mr. Ishida’s antiques apprentice, Mayumi, a troubled young woman from a famous lacquer-making family. Making use of her volunteer friends, as well as her knowledge of Japanese manners and antiques, Rei investigates Mayumi’s suspicious disappearance. Complicating the situation is a police force overwhelmed by counting the dead, and a stalker who’s set his or her own sights on Rei. I will post a review on the book once I complete the book so stay tuned. I am currently reading a hunk of a book right now so it may be a little bit but definitely will review the book. My day, was made yesterday with the delivery of this happy mail and today with the anticipation of reading it. Have you had any happy mail lately? Next PostHappy Monday from Barnes and Noble! Belinda you have me hooked. I also love Japan and to combine it with a mystery floats my boat. I will see if my library has any books by the author. Thanks for passing on this recommendation. If not, I would be happy to lend you mine. But I promise you, you will enjoy them.